Leah Pritchett is on pace to do something no one in the history of the Top Fuel division has been able to accomplish: win three straight races to start off a season. 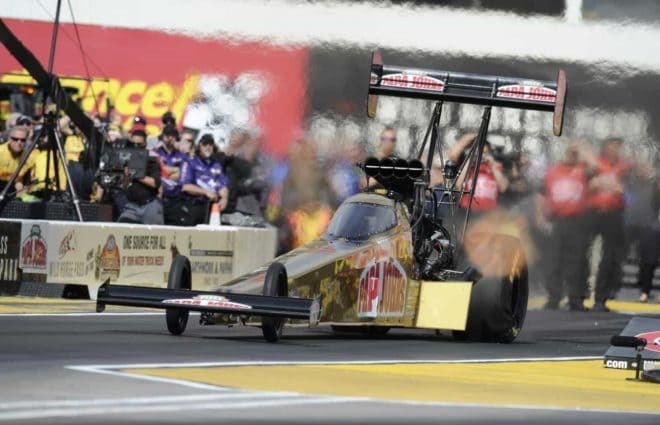 After besting Doug Kalitta at the season-opener in Pomona and Brittany Force two weeks ago at Phoenix, Pritchett is poised to score her third victory in a row, buoyed by her confidence in her team and her equipment. Pritchett currently leads the Top Fuel standings by 92 points over Tony Schumacher. Although the Thunder Valley Nationals at Bristol Motor Speedway is still three months away, the speedway has already started ramping up for the start of its 2017 season with NASCAR rolling into town in just six weeks. The speedway kicked off the new season with its official season preview event at the Paramount Center for the Arts in Bristol, Tennessee. Three-time Bristol Funny Car winner Ron Capps and fellow Funny Car driver Courtney Force were on hand, along with NASCAR drivers Clint Bowyer, Chris Buescher and Christopher Bell, to participate in a racing version of Match Game. “Leave it to Bristol and Thunder Valley and the race track to put on something like this,” Capps said. Force spoke to the media about what a thrill it was to compete against her father John Force when the NHRA hits the track on Father’s Day weekend, June 16-18. So far this season, there hasn’t been a whole lot of celebrating going on at John Force Racing. Although the team has shown some flashes of brilliance in the first two events of the season, it’s been shut out of the winner’s circle in both Top Fuel and Funny Car, despite final-round appearances by both Brittany Force at Phoenix and Courtney Force at Pomona. Next weekend’s third stop of the season for the NHRA Mello Yello Drag Racing Series at the 48th annual AMALIE Motor Oil NHRA Gatornationals at Gainesville Raceway might be the team’s best shot at getting in the win column for 2017, with team owner John Force owning seven victories at the track – tops among all Funny Car drivers and second only to Warren Johnson all-time – and teammates Robert Hight and Brittany Force winning final rounds in last year’s event. For Brittany, it was her first-career NHRA Top Fuel victory – plus the first of three wins on the season – and a big boost for her in the points, something she hopes might be in the cards again this time around. “That’s what we’re hoping for, that’s what we’re going for,” Force, who finished sixth in points a year ago. said. “We’re still looking for our first win of the season, and we’d love to repeat last year and bring home that first win at the Gatornationals. Going to the final round in Phoenix shows how close we are. We’re in a different place than where we started last year. We didn’t come into this year still looking for that first win. We’ve already done it, and we know we can do it again. It’s a whole different attitude going into this season. Next weekend’s event at Gainesville Raceway will be the first race of the season for the Pro Stock Motorcycle and Pro Mods after sitting out the first two events of the season. Defending PSM winner Eddie Krawiec will be looking for his fifth Gatornationals victory when he takes to the track next week, looking to break a three-way tie and become the all-time PSM winner at the track. Krawiec has made the final round in five of the last seven events held at Gainesville, including the last two straight years. Fans now have their chance to make their voices heard and vote in their favorite driver as the voting opens for the Pro Stocks for the K&N Horsepower Challenge. Fans can log in at http://www.nhra.com/KNChallenge to register their vote for the Fan Vote winner, who will go up against the other seven entries in a three-round shootout to be held Saturday, April 1, during the DENSO Spark Plugs NHRA Nationals at The Strip at Las Vegas Motor Speedway. The champion of the K&N Horsepower Challenge race will win a $50,000 grand prize. The runner-up will receive $10,000, with $3,000 to the two semifinalists and $2,500 to the four first-round finishers. Although the NHRA Mello Yello Drag Racing Series is off this weekend, there’s still action on the track at Gainesville as the Lucas Oil Drag Racing Series Division II rolls into town for its second event of the season. Reigning Comp Eliminator champion Jenny Treadwell will look to capitalize on her thrilling victory over Steve Schumacher at Orlando Speedworld that kicked off the Division II season two weeks ago, while defending Super Stock winner Anthony Bertozzi hopes to rebound from a disappointing third-round exit against Joe Tysinger. In Super Street, defending Gainesville winner Jonathan Anderson could make it two in a row for the season following his win in Orlando over Matt Weston. Previous NASCAR 101: Ford’s Won The Clash, the Daytona 500 & Race 2 — Has That Ever Happened? Next 4 Burning Questions: Will Focus Be on Pit Road or the Racetrack in Vegas?